Discount available! 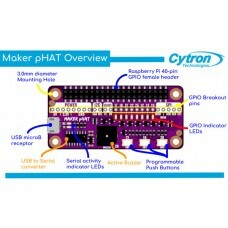 Recommend MAKER PHAT for Raspberry Pi to your friends and get your Discount. 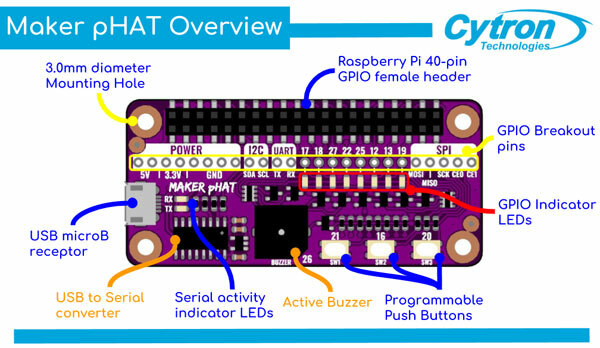 It has an USB to serial chip converter, micro USB connector, 8 LED, 3 programmable push buttons, 1 active buzzer and Standard Raspberry Pi GPIO footprint. You can program one of the 3 buttons as a button to turn off the Raspberry Pi correctly. Warning! Raspberry Pi is not included. 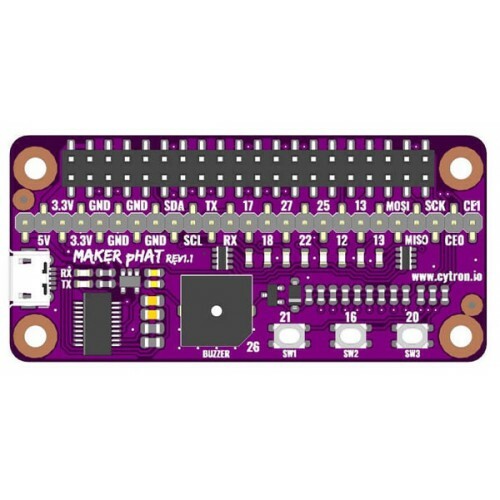 Maker pHAT is designed to be the same size as Raspberry Pi Zero board, it stacks perfectly on top of Rpi Zero with the four mounting holes aligned. Maker pHAT is compatible with Raspberry Pi Zero, 3B, 3B+ and Raspberry Pi 3A+. Raspberry Pi Zero size, stack perfectly on to Pi Zero Series of SBC (Single Board Computer). 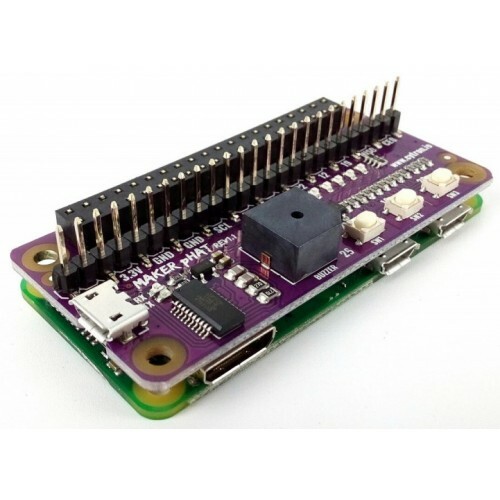 Compatible with standard size Raspberry Pi 3B/3B+, medium size Raspberry Pi 3A+ and smaller size Raspberry Pi Zero/W/WH. Standard Raspberry Pi GPIO footprint. LED array for selected GPIO pins (GPIO 17, 18, 27, 22, 25, 12, 13, 19). 3x on board programmable push buttons (GPIO 21, 19 and 20, need to configure as input pull up). On board active buzzer (GPIO 26). Proper label for all GPIOs, including SPI, UART, I2C, 5V, 3.3V, and GND. 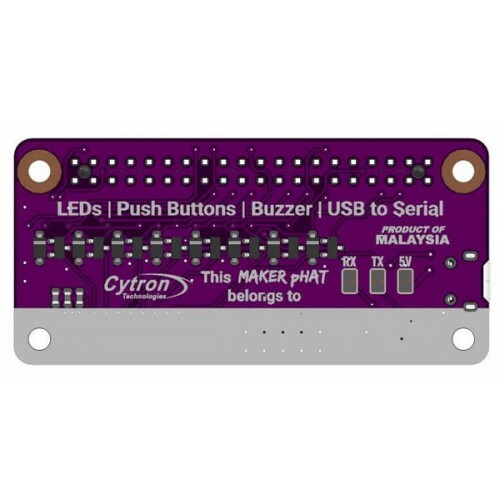 Utilize USB Micro-B socket for 5V input and USB to UART communication. Input voltage: USB 5V, from computer, power bank or standard USB adapter.